Graduate students and faculty members protesting on the fifth floor of Capen Hall during Monday’s UB Council meeting. By not moving to a larger room to accommodate members of the public who wanted to attend the meeting, the council violated New York State Open Meetings Law, according to New York State’s top open-government official. The UB Council violated New York State’s Open Meetings Law on Monday by barring students from its meeting, according to the state’s top open-government official. Roughly 50 graduate students and faculty members congregated outside Capen 505, hoping to attend the meeting. Chief of Staff Beth Del Genio told members of the Living Stipend Movement –– who were petitioning for higher graduate teaching assistant wages –– that only two representatives could attend the meeting due to limited space and the threat of violating fire code. Only 28 people were in the room for the meeting while the room’s maximum occupancy is 38 people. There were empty chairs that could have accommodated more members of the movement. According to Open Meetings Law, the council –– a public body tasked with overseeing and advising UB President Satish Tripathi –– must allow members of the public who wish to attend a meeting into the meeting. “Public bodies shall make or cause to be made all reasonable efforts to ensure that meetings are held in an appropriate facility which can adequately accommodate members of the public who wish to attend such meetings,” section 103 of article seven of the Open Meetings Law states. UB spokesperson Kate McKenna provided a statement from the university, stating the council didn’t violate the Open Meetings Law. Because council meetings traditionally attract a small number of public observers, it was not prepared to accommodate the large number of protestors. Since the meeting is live-streamed on the council’s website and protestors could have watched online, the university feels it did not violate the law. “At Monday’s Council meeting, the meeting attracted many more public observers than it has in the past," the statement said. "Two graduate student representatives were seated in the meeting room and the group was informed that the meeting was being live-streamed and that footage would also continue to be available on the UB Council website. To that end, the university believes that Monday’s UB Council meeting conformed to NYS Open Meetings Law requirements." Robert Freeman, executive director of the New York State Committee on Open Government, said the council’s actions were an “obvious” violation of the law. He said this isn’t the first time the council has violated the law and he’s not surprised by its actions. There are larger meeting rooms within the Office of the President that could have been used for the meeting. Freeman said it’s no excuse if council members were worried about taking too much time or delaying the meeting. The peaceful protest was advertised on flyers around campus and council members saw the large group of protestors prior to the meeting. Freeman said they should have expected a large turnout and had ample time to find a better location. The UB Council also ignored council student representative Mike Brown’s motion for a period of public comment. Nobody on the council seconded Brown’s motion. Chairman Jeremy Jacobs acknowledged Brown’s requests but did not allow the council to vote on the matter and immediately adjourned the meeting. Brown did introduce a resolution from the Council of Advocacy and Leadership to support the Living Stipend Movement with the hope to vote during the council’s next meeting in December. Stephanie Gill, a Ph.D. student in the biological sciences department, was one of the two graduate students allowed into the meeting. She said after waiting the entire meeting to speak to the council, it’s disappointing that they adjourned without public comment and fled down a back staircase, avoiding protestors’ questions. Gill said she’s tired of administrators making the stipend issue seem like a problem only within the English department. She said other departments, like hers, have a higher stipend package than the English department but are still below the national average. Ariana Nash, a Ph.D. student in the English department, was the other graduate student allowed to attend the meeting. 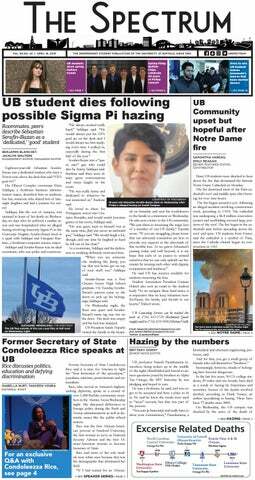 She said the actions of the UB Council show that it doesn’t care about students and reinforces the fact that UB is run like a business, not in the interest of its students.